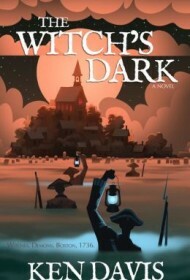 Described by the author as alternate history, this grisly thriller explores supernatural events in Salem, Massachusetts, and the surrounding areas in 1736. Focusing on four main characters, with multiple storylines and a blending of history, fantasy, and horror, this ambitious novel serves as an intriguing introduction to the planned series. Cate, a young half-witch, hides her limited magical abilities while working at the family bakery and secretly aiding the rebellious Rattlesnake Society. When her boyfriend, family, and co-workers are murdered, she does whatever is necessary to survive. Augustus Swaine, an aging sorcerer, works secretly and tirelessly to re-animate corpses with controlled demon entities. When he hires a young mute apprentice, Swaine develops a fondness for the boy and begins to question the wisdom of his experiments. Captain-Lieutenant Henry Rigsdale publicly lives to serve the governing Whitelocke family while privately hiding his forbidden romance. Time and again, Henry must shift loyalties and remember his duty despite his desires. Grayson Whitelocke is a profane, drunken womanizer who brings shame to his renowned family. When his brother, the governor, dies suddenly, Grayson must determine if he can adequately take over the position. All four characters become entangled in the dangerous “shadowrise,” a time that “spawns an influx of predatory entities, demons.” No one is safe from these flesh-tearing, soul-devouring creatures. The story concludes abruptly with the announcement: “Here ends Book One…” Some readers won’t mind waiting for the next book, but the lack of resolution may disappoint those who prefer each series installment to stand on its own.